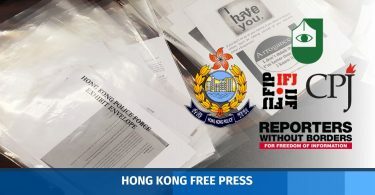 Taiwan’s Ministry of Foreign Affairs has protested Qatar Airways’ decision to change the nationalities of its crew members from Taiwanese to Chinese (TWN) on their registration documents. According to Taiwan’s Central News Agency, the Ministry of Foreign Affairs said at a press conference on Tuesday that the nationalities of around 100 Taiwanese flight attendants at Qatar Airways were changed on their ID documents owing to pressure from China. Chen Chun-shen, director-general of the ministry’s Department of West Asian and African Affairs, said that Taiwan does not have any embassies or consulates in Qatar, and the airline did not have any routes to Taiwan, but the ministry protested the move through other channels, and asked the airline to cancel the policy. 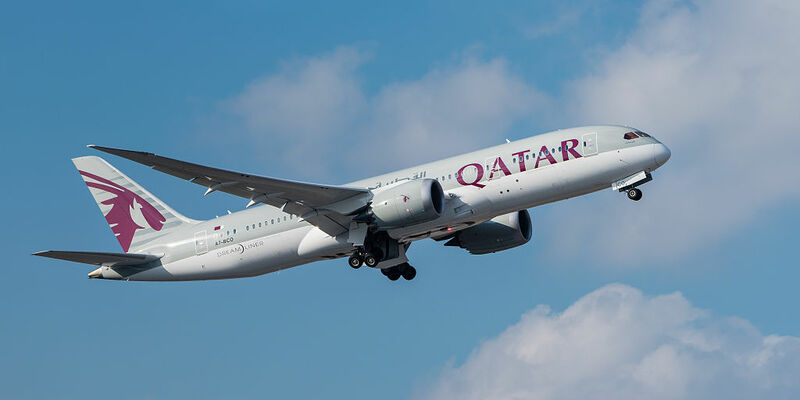 He also said that the matter did not concern the Qatar government, only the private airline, which may have received pressure in light of its routes through China. 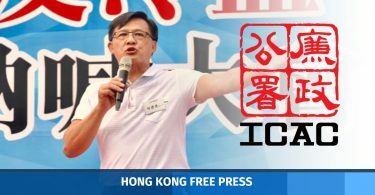 Chen said that the Taiwanese government does not have any commercial bargaining chips, as Qatar does not fly to Taiwan. He said that, in a similar case with Emirates, the airline changed its policy because it had routes to the island. An anonymous Taiwanese crew member at Qatar Airways told Apple Daily in September that the airline had changed Taiwanese crew members’ nationalities from Taiwanese to Chinese (TWN) without notifying them. The crew member said that they were told the company did so following a request from the Chinese immigration authorities. “The change was made at the direction of the Chinese Immigration Authorities and to comply with the Government regulations and stations who advised that the Nationality details of all Taiwanese staff should reflect as Chinese (TWN) on the list of Entry Departure Flight and Staff Pattern and Register,” a screenshot of an email apparently sent by an HR staff member and supplied to Apple Daily said. 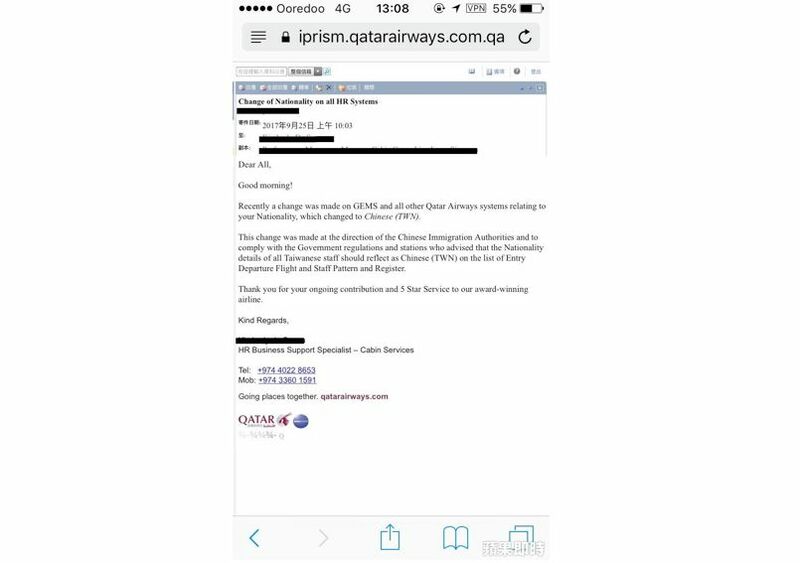 A net user claiming to be a Qatar Airlines flight attendant later posted on Taiwan’s PTT forums, confirming the report and saying that their nationalities were changed on the company’s system on September 13. She said that Taiwanese crew members were previously banned from flying to China, as they were required to change their nationalities from TWN to CHN on their travel documents before they were permitted entry. Apple Daily also reported in July that Air Asia had changed the nationalities of Taiwanese crew members on the General Declarations for its China flights after receiving pressure from Chinese customs. In June, Emirates said it was recalling all flag pins worn by cabin crew, after an internal email ordering crew members to remove Taiwanese flags from their uniforms sparked controversy after it was leaked to the public. HKFP has contacted Qatar Airways for comment.